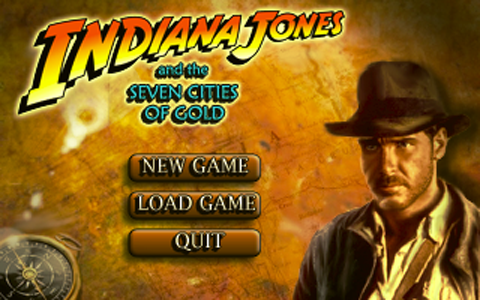 Indiana Jones and the Seven Cities of Gold is a fan-made Indiana Jones point and click adventure. The game will be done in the classic Fate of Atlantis style. The game is under development right now. It is being made with Adventure Game Studio (AGS). Check the forum for news and updates on the game. The year is 1940. The world is in turmoil as the Second World War engulfs it. Hitler's Nazi forces are rapidly marching across Europe, and the forces of Imperial Japan are sweeping across the Pacific. Returning from yet another adventure, our hero Indiana Jones receives a telegram from his colleague Marcus Brody asking him to meet him in the deserts of Arizona. Traveling to Arizona, Indiana meets up with Marcus and an amazing discovery catapults the man with the Hat into a new adventure - this time in search of the legendary Seven Cities of Gold. As Indy once again travels across the globe, he teams up with George and Elizabeth Stenson to aid in the search for the Cities. But the Third Reich wants to find the Cities as well, and has dispatched agents to find it. According to the legend of the Seven Cities of Gold, the Cities are said to contain incredible wealth and amazing ancient secrets which in the hands of the Nazis would aid them in their conquest of the globe. With the fate of the free world hanging in the balance, Indy and his friends become entangled in a deadly race to find the Cities first and keep the Nazis from unlocking the secrets of the Seven Cities of Gold. Complete with sinister villains, rewarding puzzles, exotic locations and the secrets of a long-forgotten culture, Indiana Jones and the Seven Cities of Gold will be full of all the familiar Indy charm, as well as new additions by loyal fans of the series to make this game a fun and exciting endeavor into adventure gaming. The Man with the Hat! Known as Indy to his friends, he is an archeologist and a professor. But when he is not teaching classes at Barnett College in New York State, he travels across the globe unearthing lost artifacts and unlocking ancient secrets. Now the race for the Seven Cities of Gold is on and with his trademark hat, leather jacket and bullwhip - Indy is ready for adventure. A very proper English gentleman, Marcus is a close friend of Indy and a curator of a museum. Many artifacts that Indy has discovered in his travels are on display in his museum. While usually content to listen to Indy's exploits, sometimes he joins Indy on his adventures. Now he must aid Indy in the quest for the Seven Cities of Gold. A ruthless Nazi agent and a fanatical follower of Hitler. Von Schroeder gained his reputation as a secret agent during in the First World War. When the Nazi party started to gain control of Germany, Von Schroeder managed to climb the social and political ladder by lending his espionage skills to the party. Because of his ruthless reputation he is known as the Iron Wolf, as he has no regard for those who oppose the Nazi party, and is rumored to have even turned in his own family over to the Gestapo. He follows orders to the letter and no cost is too great in achieving whatever mission the Nazis give him. Now he is on orders from Berlin to find the Seven Cities and their secrets for the Third Reich. Professor who is an expert on the lore of the Seven Cities. He has a brilliant mind, but he also tends to be eccentric and absent minded at times. He has been mocked by his academic colleagues and deemed a crackpot because of his instance that the legends of the Seven Cities have historical basis. But with the Nazis in hot pursuit of the Seven Cities, George's once mocked knowledge of the Cities will prove invaluable. George's blonde and beautiful sister. Like her brother she has a brilliant mind, but also like her brother she tends to be slightly absent minded at times as well. She first met Indy when she attended the University of Chicago. Now once again she crosses paths with Indy. She wanted Indy's interest in their schooldays and never got it, but can she get it this time? Control Indy and also at times his friends in the adventure. Travel across the world in the course of the adventure - Spain, France, Jerusalem, England, and Mexico are among the places Indy visits. IQ point system with more than one way to solve some puzzles.